The debate between Alexandra Irene Larsen and Harald Olsen (two Norwegian intellectuals) shows that what Islam says about itself has never been questioned. Yet, for Muslims the Quran is something that was revealed and then kept pure as a fresh fruit kept in the fridge.The whereas in fact the Quran had several oral and written versions. It was then embroidered over the years and over the centuries. It is not a book ready, intelligibly written, ordered, bound and thrown at the head of Mohammed by a well-identified flying angel. The present quran is the result of a work, a reflection and a choice of texts.The Quran is a human work and has nothing miraculous about it. All the concepts and stories which the Quran contains are known for millennia before. Even the Muslim rites are not new. Other peoples practiced them in other forms, sometimes even as recommended or ordained by the Quran. The Quran reveals nothing, so it is not a revelation. Just as the 10 commandments reveal nothing unknown until then. I know that it is impossible for a lambed person to know that Islam is a lie on which thousands of lies are built. However, a professor or an intellectual has the duty to approach these subjects impartially, with the ethics of doubt and the respect of the historical truth to provide more information on the arabian peninsula desert of the 6th century, and on the civilization of the Beduins who inhabited the region. What is it of its manners, its social organization, its political organization, its literature, its authors? The intellectuals of the free world have the duty to ask these questions. But instead of asking questions about what is possible and impossible in Arabia in the 6th century, Western intellectuals repeated, tirelessly, word for word what any imam obscurantists tells them about Islam And on pseudo conquests made by the Muslims. They repeat stories without ever going to the historical sources which tells the stories related to Islam since its gestation. No one questions the impossibility and possible feasibility of the actions often described as justified by the magical power of the eternal powerful omnipotent. What do we know of these tribes where only intrigue, fear, fighting, the miracles of the mysteries are brought back to us? On the other hand, those concerning scientific, anthropological, ethnological, historical and epigraphical studies, etc., are non-existent. Why are searches in Arabia not carried out or authorized, if there is nothing to hide, when people from all countries of the world seek to discover their ancestors through their civilization? What do we know about the number of tribes, their tongues, their numbers, their descendants, their pagan and religious heritage, their degree of civilization, their various arts and their ability to build an army in a fraction of the time, ready to the conquest the a more enlightened and advanced world, whose history we know? What was supposed to be a short introduction to an article, becoms endless if I continue to quote the clutches which I have to address to the European intellectuals. I end the introduction here to continue the original article. There are no traces of Islam in Arabia. 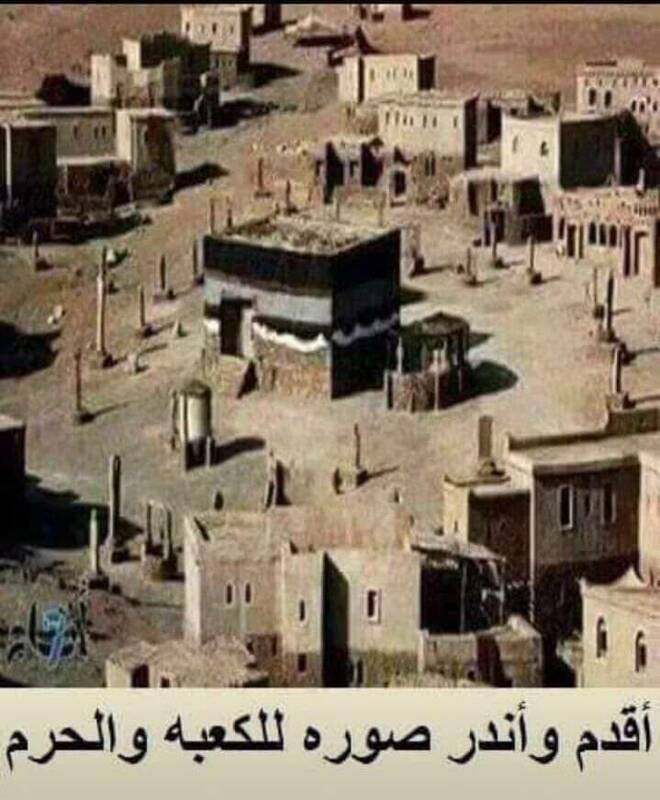 The only Islamic sanctuary in Arabia (Kaba), attributes the Muslims its origins to Abraham. This figure might have been Islamized by anti-dated decree to give a skin of context in the release of dissident rabbis. Not even the Arabic language existed. The scattered texts that later formed the Quran were written in Syrian-Aramaic. The official Quran was prepared after the Arabic language had been formalized to be readable. The Arabic language was not developed by Arabs from Arabia. It was developed somewhere else, possibly by Jews and Christians an north Africans Christian probably contributed to the construction of so-called Arabic grammar . It was only then that the Islam we know today became this religion. All this occurred during the following centuries after the abandonment of the supposed prophet Mohammed. This character Mohammed was created by all the pieces from the characteristics of well-known Jewish, Christian, Zoroastristic, Greek and legendary personalities. Mohammed is a puzzle, assembled and placed in Arabia. A bit of Moses, some of Jesus, some of Abraham, some of Alexander the Great, some of Adam, some of John, some of David, some of Satan and some of Rocco Sifredi. He is like the Quran: incoherent, messy, changeable, unstable and without substance. As in the preparation of the Quran, different authors have embroidered on the character Mohammed. Most of them had nothing to do with Arabia. At these times, the infamous Saracen lived mostly in Syria and most were former soldiers serving the Persians. The Islam we know today is a very modern doctrine, and has very little with Islam in the 11th century. This religion started to become popular only since European colonialism with the emergence of modern states organized in nations led by kings supported by an administration. It is the emergence of mass education funded by states that have Islamized peoples who are Muslims today. The more this education in the Arab states becomes universal and effective, the more people learn and understand their religion. This explains the damage today. A schizophrenic religion, a schizophrenic text, a schizophrenic prophet, today results in that one and a half billion people are schyzophrenic. The Judeo-Nazerian rabbis have won. Ironically, today, Jews and Christians themselves believe in the story of Mohammed, the Quran, the revelation and Islam born in Arabia. The United Nations, what is it? Algeria: the hunting of Christians continues. They wanted their Arab-muslim state? – Well, they have it. Mohammed never existed and the Koran is a historical imposture! MÜNSTER, Germany — Muhammad Sven Kalisch, a Muslim convert and Germany’s first professor of Islamic theology, fasts during the Muslim holy month, doesn’t like to shake hands with Muslim women and has spent years studying Islamic scripture. Islam, he says, guides his life. So it came as something of a surprise when Prof. Kalisch announced the fruit of his theological research. His conclusion: The Prophet Muhammad probably never existed. Read a translated excerpt from “Islamic Theology Without the Historic Muhammad — Comments on the Challenges of the Historical-Critical Method for Islamic Thinking” by Professor Kalisch. Muslims, not surprisingly, are outraged. Even Danish cartoonists who triggered global protests a couple of years ago didn’t portray the Prophet as fictional. German police, worried about a violent backlash, told the professor to move his religious-studies center to more-secure premises. When Prof. Kalisch took up his theology chair four years ago, he was seen as proof that modern Western scholarship and Islamic ways can mingle — and counter the influence of radical preachers in Germany. He was put in charge of a new program at Münster, one of Germany’s oldest and most respected universities, to train teachers in state schools to teach Muslim pupils about their faith. Prof. Kalisch, who insists he’s still a Muslim, says he knew he would get in trouble but wanted to subject Islam to the same scrutiny as Christianity and Judaism. German scholars of the 19th century, he notes, were among the first to raise questions about the historical accuracy of the Bible. Many scholars of Islam question the accuracy of ancient sources on Muhammad’s life. The earliest biography, of which no copies survive, dated from roughly a century after the generally accepted year of his death, 632, and is known only by references to it in much later texts. But only a few scholars have doubted Muhammad’s existence. Most say his life is better documented than that of Jesus. “Of course Muhammad existed,” says Tilman Nagel, a scholar in Göttingen and author of a new book, “Muhammad: Life and Legend.” The Prophet differed from the flawless figure of Islamic tradition, Prof. Nagel says, but “it is quite astonishing to say that thousands and thousands of pages about him were all forged” and there was no such person. Prof. Kalisch’s religious studies center recently removed a sign and erased its address from its Web site. The professor, a burly 42-year-old, says he has received no specific threats but has been denounced as apostate, a capital offense in some readings of Islam. “Maybe people are speculating that some idiot will come and cut off my head,” he said during an interview in his study. A few minutes later, an assistant arrived in a panic to say a suspicious-looking digital clock had been found lying in the hallway. Police, called to the scene, declared the clock harmless. A convert to Islam at age 15, Prof. Kalisch says he was drawn to the faith because it seemed more rational than others. He embraced a branch of Shiite Islam noted for its skeptical bent. After working briefly as a lawyer, he began work in 2001 on a postdoctoral thesis in Islamic law in Hamburg, to go through the elaborate process required to become a professor in Germany. The Sept. 11 attacks in the U.S. that year appalled Mr. Kalisch but didn’t dent his devotion. Indeed, after he arrived at Münster University in 2004, he struck some as too conservative. Sami Alrabaa, a scholar at a nearby college, recalls attending a lecture by Prof. Kalisch and being upset by his doctrinaire defense of Islamic law, known as Sharia. He had no doubts at first, but slowly they emerged. He was struck, he says, by the fact that the first coins bearing Muhammad’s name did not appear until the late 7th century — six decades after the religion did. He traded ideas with some scholars in Saarbrücken who in recent years have been pushing the idea of Muhammad’s nonexistence. They claim that “Muhammad” wasn’t the name of a person but a title, and that Islam began as a Christian heresy. Prof. Kalisch didn’t buy all of this. Contributing last year to a book on Islam, he weighed the odds and called Muhammad’s existence “more probable than not.” By early this year, though, his thinking had shifted. “The more I read, the historical person at the root of the whole thing became more and more improbable,” he says. He has doubts, too, about the Quran. “God doesn’t write books,” Prof. Kalisch says. Some of his students voiced alarm at the direction of his teaching. “I began to wonder if he would one day say he doesn’t exist himself,” says one. A few boycotted his lectures. Others sang his praises. Prof. Kalisch says he “never told students ‘just believe what Kalisch thinks’ ” but seeks to teach them to think independently. Religions, he says, are “crutches” that help believers get to “the spiritual truth behind them.” To him, what matters isn’t whether Muhammad actually lived but the philosophy presented in his name. This summer, the dispute hit the headlines. A Turkish-language German newspaper reported on it with gusto. Media in the Muslim world picked up on it. Germany’s Muslim Coordinating Council withdrew from the advisory board of Prof. Kalisch’s center. Some Council members refused to address him by his adopted Muslim name, Muhammad, saying that he should now be known as Sven. German academics split. Michael Marx, a Quran scholar at the Berlin-Brandenburg Academy of Sciences, warned that Prof. Kalisch’s views would discredit German scholarship and make it difficult for German scholars to work in Muslim lands. But Ursula Spuler-Stegemann, an Islamic studies scholar at the University of Marburg, set up a Web site called solidaritymuhammadkalisch.com and started an online petition of support. Alarmed that a pioneering effort at Muslim outreach was only stoking antagonism, Münster University decided to douse the flames. Prof. Kalisch was told he could keep his professorship but must stop teaching Islam to future school teachers. The professor says he’s more determined than ever to keep probing his faith. He is finishing a book to explain his thoughts. It’s in English instead of German because he wants to make a bigger impact. “I’m convinced that what I’m doing is necessary. There must be a free discussion of Islam,” he says. —Almut Schoenfeld in Berlin contributed to this article. Despite Muhammad’s exalted place in Islam, even today there is still surpisingly little actually known about this shadowy figure and the origins of the Qur’an because of an astounding lack of verifiable biographical material. Furthermore, most of the existing biographical traditions that can be used to substantiate the life of Muhammad date to nearly two centuries after his death, a time when a powerful, expansive, and idealized empire had become synonymous with his name and vision – thus resulting in an exaggerated and often artificial characterization of the prophetic figure coupled with many questionable interpretations of the holy book of Islam. On the basis of datable and localizable artifacts from the seventh and eighth centuries of the Christian era, many of the historical developments, misconceptions, and fallacies of Islam can now be seen in a different light. Excavated coins that predate Islam and the old inscription in the Dome of the Rock in Jerusalem utilize symbols used in a documented Syrian Arabic theology – a theology with Christian roots. Interpreting traditional contexts of historical evidence and rereading passages of the Qur’an, the researchers in this thought-provoking volume unveil a surprising – and highly unconventional – picture of the very foundations of Islamic religious history. I wonder why Allah was so afraid of the Arabs. His fear he expresses with anger and insults very virulent against the Arabs.